An incomplete copper alloy Roman nummus of Constantine II (AD 317-340) dating to the period AD 335-337 (Reece Period 17). GLORIA EXERCITVS reverse type, depicting two soldiers and one standard. 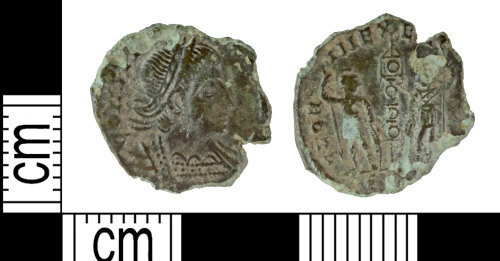 Mint of Siscia. RIC VII, p. 458, no. 253 or p. 460, no. 262.